Australian RSPCA thigh fillets are a lovely chicken we love to buy.I use these in so many different recipes and the taste is very good! These chicken fillets are great to buy. I love that they are packaged in portions. This means that I can pop them in the freezer and just take out one or two as I need them. Because they are thigh fillets, they are very flavoursome, but having the skin removed means that they aren’t as fatty. These are great best buy in bulk each packet is sealed in freshness and nice and easy to tear a packet off from the freezer for a family meal! So nice and easy without that pesky bone in there! 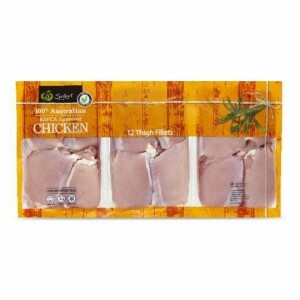 How would you rate Australian Rspca Approved Fresh Chicken Thigh Fillets Skinless Portion Pack?